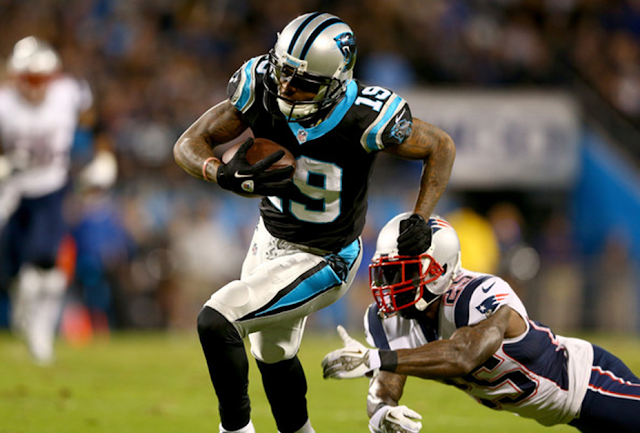 CHARLOTTE, N.C. -- Ted Ginn Jr. is rejuvenating his career with the Carolina Panthers. Ginn, who was an afterthought the last three seasons on offense with the San Francisco 49ers, has emerged as a valuable receiving threat -- as well as a returner -- for the surging Panthers (7-3), who have won six straight games. Ginn has 24 receptions for 411 yards and three touchdowns, including the winning 25-yard TD catch from Cam Newton with 59 seconds left in Carolina's 24-20 win over the New England Patriots on Monday night. The seven-year NFL veteran has nearly as many receptions this year as he did in his three combined seasons in San Francisco (31). And his three TD receptions this season already stand as a career best. Ginn said coming to Carolina has been a "blessing" and there's little doubt he has fit in well as Carolina's No. 3 receiver behind starters Steve Smith and Brandon LaFell. Newton has been spreading the ball around and six Carolina receivers have at least 15 receptions. "It's good when everyone is eating," Ginn said with a laugh. He didn't eat much last year. Ginn caught two passes for 1 yard in 2012 for the 49ers, used primarily as a returner by coach Jim Harbaugh. Panthers quarterback Cam Newton said Ginn arrived in Charlotte ready to prove he could do more than just field punts and kickoffs. "He was kind of that stigma special teams All-American," Newton said. He comes here very hungry trying to learn from Steve Smith and those guys and they're all feeding off each other." Coach Ron Rivera has raved about Ginn's speed, saying he's a player who can "blow the top off the defense." Ginn's other two TD receptions this season went for 40 and 47 yards after he got behind the defenders. Cornerback Captain Munnerlyn said he was shocked when Ginn told him before the season how little he'd been used in the passing game in San Francisco. "Man, I couldn't believe it," said Munnerlyn, who faces Ginn daily in practice. "I feel like he's the complete package. He can run by you. He can run great routes. And he can catch the ball. It's scary to go against a guy like that who is so fast." On Sunday Ginn will make his return to Miami to face the Dolphins, the team that drafted him in the first round in 2007 and traded him away three years later. It's his second homecoming game in three weeks. He avoided questions about his return to San Francisco, where there were differing opinions on how he should be used on offense. As for the Dolphins, Ginn said there are "no hard feelings." "It was for the betterment of both situations," Ginn said of his departure from South Florida. "I had my time there and enjoyed it and it started me off." Now he's trying to start over. Ginn signed a one-year, $1.1 million contract with the Panthers, so he's playing for a future contract. He'd like to remain in Carolina where he's found a role on offense he didn't have in San Francisco and the quarterback stability he lacked in Miami. "Oh yeah, it is a big difference," Ginn said of playing with Newton. "Any time you know what you're dealing with at quarterback. (In Miami) you might have a guy come in off the street and be the starter for the week. But they have moved past it and it's over with and done. Hey, I'm with the Carolina Panthers and having a good time." "He's been in the league seven years, but it seems like his career is just starting to take off," Munnerlyn said.